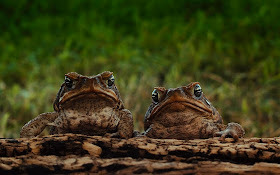 Two cane toads. 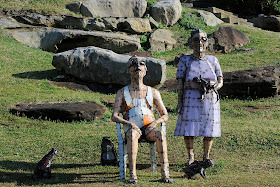 Image courtesy Mark Lewis, Radio Pictures, Mullumbimby. Today’s post contains not only a fantastically gross case study of ingestion of a canine toad by an unwitting canine, some practical first-aid tips and some previously little known history about the introduction of cane toads into Australia, thanks to a dedicated scholar who unearthed some incredible documents. 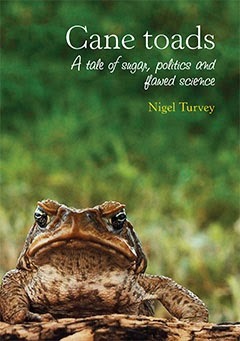 But according to Charles Darwin University’s Nigel Turvey, author of CaneToads: A tale of sugar, politics and flawed science, there’s no single individual or institution at which to squarely point the finger (and that’s not for want of trying – he admits that he spent five years trying to uncover the blame-worthiest target). In fact, what we should be doing is examining the history and asking how such an unfortunate sequence of events came about – because history loves repeating itself. Dr Turvey brought a friend along to the launch – Michael, the grandson of Cyril Pemberton, the entomologist who brought cane toads into Hawai’i, from where they were shipped to Australia. When Michael was introduced to the room, there was an audible gasp. I am dead certain that the guy sitting across the aisle from me was thinking, “If only I could get hold of a time machine and bump off his grandpa…”, but I suspect he’d changed his mind by the conclusion of proceedings. The talks that followed were gripping. The folks that brought cane toads to our shores were far from boneheads. They were credible scientists, on top of their game. As Michael said, his grandfather was a studious, decent family guy who spent months researching any species in its environment before importing it, studying it further then releasing it as a means of biological control (in those days, that was considered an appropriate time frame for study). The sugar cane industry was being punished by the impact of the scarab beetle, the larva or grubs of which knaw the roots of sugar cane and destroy it. 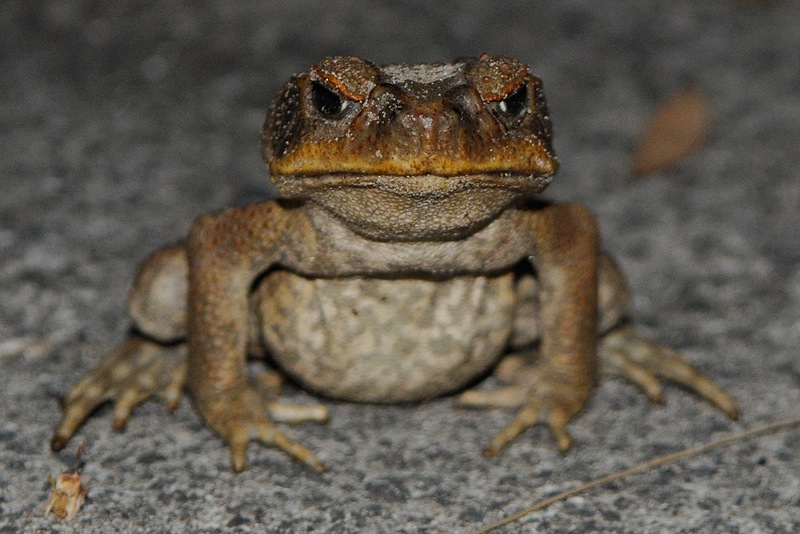 It happened that cane toads had been used around the world as a form of biological pest control. In France in the 1800s they even had toad markets, at which people would drop in and pick up a few toads to control snails and slugs in their gardens. Imagine ducking out to the shops. "Honey, I'm just off to grab a few cane toads for the garden - need anything while I'm out?". 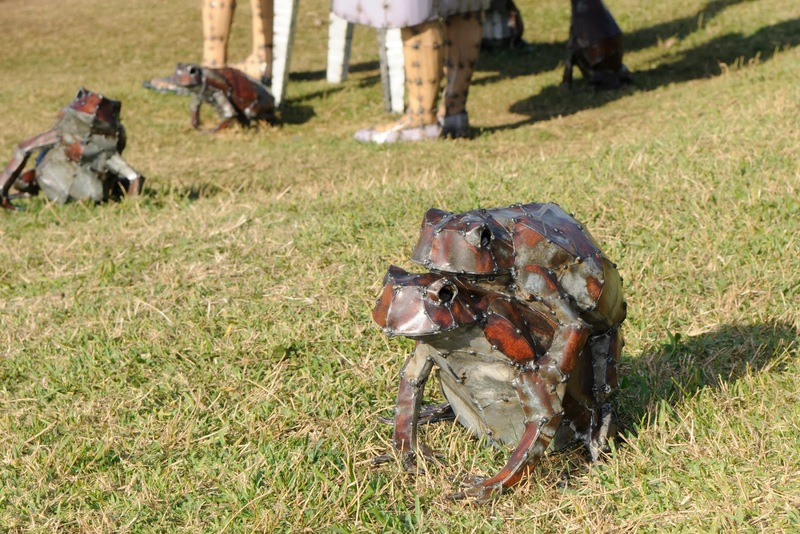 Toads on Tour at Sculptures by the Sea, by Hannah Kidd. Fast forward to the 20th century, where scientists were debating the merits of the cane toad, Bufo marinus, as a means of controlling the scarab beetle. Remember, this is in the pre-pesticide era. Biological control was all the rage. A scientist named Raquel Dexter collected 301 cane toads and dissected them, analysing their stomach contents. She found that they had eaten adult beetles, and presented a small paper in a stream at a conference that concluded (falsely) that cane toads control the grub. No one challenged it. That paper, Dr Turvey argues, had disproportionate influence over members of the sugar industry and key scientists. The essence of the dumb idea was the assumption that earthbound toads would control soil-dwelling grubs by eating the airborne adults. The truth is that cane toads didn’t spread around the world – they were PULLED. They were in hot demand because just about everyone thought they were awesome. In Australia, the trigger was spring rains in Brisbane in 1932. It rained all weekend, and Bureau of Sugar Experiment Stations scientist Arthur Bell knew the bugs would pupate and growers would get on his back. The following day he went to his office and wrote a memo to his staff proposing introduction of the cane toad. One dissented, to which Bell responded with a copy of Dexter’s paper. The dissenter became a convert and personally escorted the first shipment to Australia. On Monday, June 17, 1935, Bufo marinus docked in Sydney Harbour. They were released in Cairns on August 19. Artist's impression: Hannah Kidd's sculpture indicating just how cane toads conquered Australia. The only vocal opponent was the aptly named Walter Froggatt, the retired former Chief Entomologist of NSW. In letters unearthed by Dr Turvey, Froggatt wrote that “all our small ground fauna will be at their mercy and become their prey.” History proved him correct, but at the time everyone pooh-poohed him as a pessimistic nay-sayer. The Prime Minister at the time, Joseph Lyons, personally signed off on the toad release. 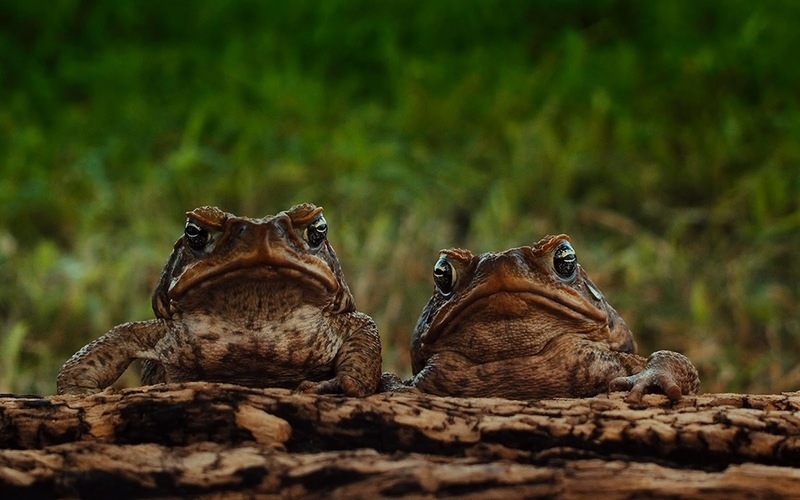 The terrible truth is that the cane toad “was the product of a consensus of well-trained scientists in prestigious institutions, and the companies and funding organisations that supported them,” Dr Turvey said. The thing is, it took much longer than months to work out that the introduction of cane toads was a mistake. Everyone was blinded by the expectation that these creatures would save the sugar industry. And why not? Dr Turvey summarised this: cane toads came from a background where biological control had been successful; it replaced nasty pesticides like arsenic; was supported by a published, scientific paper; had international peer review; was endorsed by our peak scientific body (the then CSIR) and a consensus of scientists; championed by industry; promoted by the QLD Govt; subjected to quarantine and even endorsed by the PM. The big question, of course, is whether we (scientists today) are qualitatively different? Shouldn’t we always be suspicious of a consensus of experts – given their diverse backgrounds and perspectives – and shouldn’t scientists always question the science? It was 40 years before the first research (a 1975 survey) was published – and 70 years before the impact of cane toads began to be fully appreciated (well, I am not sure that appreciated is the right word there). The big problem for Australia was that while toads had been introduced to other countries, those countries had predators that had evolved to cope with native toad poisonings. There were NO native toads in Australia. Subsequently we had a wave of native animal mortalities that had not been seen anywhere else. The audacity: this cane toad posed for me. According to Professor Shine, native mammal populations were already in decline before the advent of the cane toad – but for many species that was the final nail in the coffin. Cane toads lay 30,000 eggs per clutch, but according to Professor Shine there is evidence that the ecosystem is fighting back. There is evidence that aversion training of quolls and even blue-tongue lizards can prevent fatalingestion of cane toads by these species. He said that there is evidence that educating a single generation of a species was enough to pull them out of a toad-related extinction vortex, but added that no one had had much success in training snakes. [If you have a weak stomach, please don't scroll down - the next photo is pretty disgusting]. A couple of years ago now my colleague Dr Stephen Cutter treated a colourful case of cane toad ingestion in which the toad survived being swallowed by a dog and spending 40 minute’s in the animal’s stomach. The top-end toad, which was expelled following a single dose of apomorphine, was shaken but remarkably unscathed. The dog survived too. 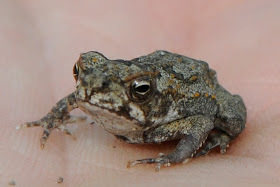 Toads produce bufotoxins which, when ingested, can lead to a range of disturbing clinical signs including hypersalivation, vomiting, restlessness, seizures and death. 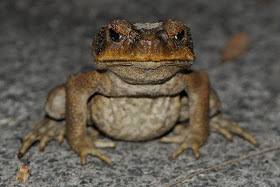 Often pets that have ingested cane toads are found dead, though low doses of the toxin aren’t usually fatal (some dogs will get away with mouthing a cane toad, and there are reports of some animals and a few stupid humans becoming addicted to the toxin, licking the backs of toads and acting “stoned”. When Steve saw this particular dog, Bella, a female Staffordshire terrier cross, she had no clinical signs. Oh yes. He was sure. The owner had been dumping the contents of his freezer – an assortment of mince, pies and pasties – in his backyard when Bella hoed in. A toad jumped onto the pile when she took a gulp, in full view of the owner. On induction of vomiting, Bella produced a bunch of semi-frozen meat, and a solitary toad. Photo courtesy of Dr Stephen Cutter. Bella, still a bit drowsy from her apomorphine injection, didn’t bother to chase her former tenant. His hypothesis (which remains unconfirmed by double-blinded, placebo controlled studies) is that the party pies and pasties protected the toad from the harsh gastric acid in Bella’s stomach. What do you do if your pet eats a cane toad? You can read Dr Stephen Cutter's article about first aid for cane toad toxicity here. If the cane toad is in your pet’s mouth, remove it. Gently rinse the mouth out with a slow-hose or tap water, being careful to point the hose across (not towards the back of) the mouth – you don’t want to drown the animal. Use a damp cloth to wipe the mouth and gums as the toxin is very sticky. If your pet is exhibiting twitching, tremors or seizures, seek veterinary attention immediately.